Banpresto - Japanese Bath Bomb Maker | Memorable Days : Beauty Blog - Korean Beauty, European, American Product Reviews. This is old product, but I think that it is worth a blogpost on my blog ^__^. Remember my old post about Japanese gadgets? Today I have another cool gadget to share haha. It's actually a machine called the bath bomb maker. 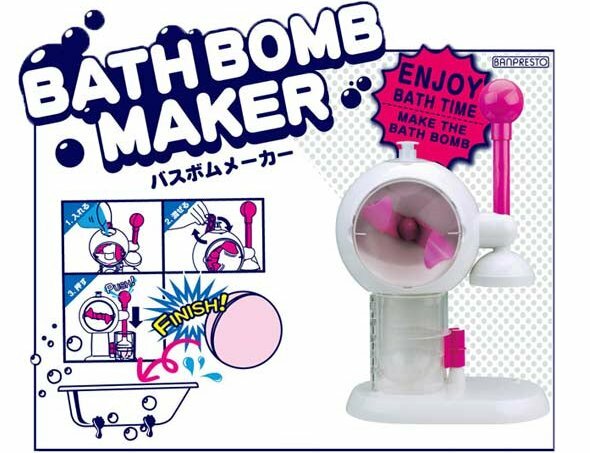 The bath bomb maker is manufactured by Banpresto, a Japanese game development firm. I never thought that it was so EASY to make a bath bomb o__O". Why are bath bombs so expensive while it's so easy to make :S? All you need is baking soda, citric acid, water and essential oils. This machine is quite expensive though, it's around $116 *kaching*. Check out this old video to see how this machine works. Even though its an old video I enjoyed watching it xD lol. Would you buy this machine? muwhaha xD. Best een grappig ding, alleen ik zou dat nooit kopen, en ik heb ook geen bad (Y). Hmm... je eigen business in bath bombs beginnen. Misschien een extra idee voor je webshop XD?? O.O I want one!! Zo jammer dat het een beetje duur is (zo vaak gebruik ik nu ook weer geen bruisballen) maar wow wow wow, ik wil zoeen!! HAHAHAHAH grappig! Ik ga bijna nooit in bad maar als ik dat wel zou doen zou ik zeker zo'n ding kopen xD echt vet leuk dat je het met ons deelt! ahah this is super fun. i will definite get one of these if i could find it. @vanity, yeah super expensive, i wouldn't buy it =S way too expensive !! don't spam on my blog.